In this charming biography especially for young people, Mark Bozzuti-Jones gives us a warm and caring glimpse of Barbara C. Harris, the first woman to be ordained a bishop in the Anglican Communion. Based on conversations with Bishop Harris, her family, and her close friends, Bozzuti-Jones addresses complex issues of faith, discrimination, and the presence of God in ordinary events. This is an excellent gift for confirmation or baptism, or for anyone curious to know the answer to the question, "Where do Bishops come from? 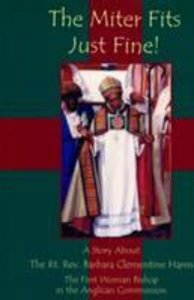 "-an engaging story of the ordinary and extraordinary life of a remarkable bishop. About "The Miter Fits Just Fine"
Bozzuti-Jones works as the Children's Ministries Specialist for the Episcopal Diocese of Massachusetts.